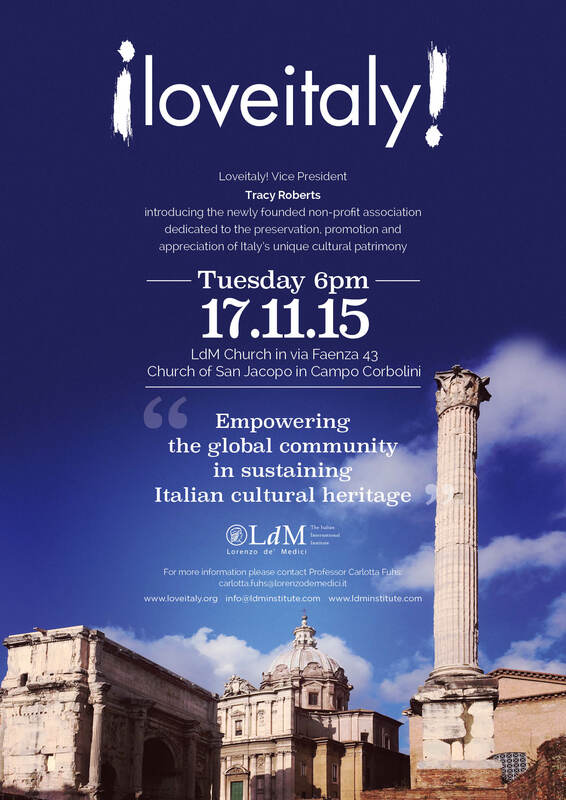 LdM teams up with crowdfunding platform LoveItaly! #BEpArtofHistory is the catchy hashtag with which the newly founded crowdfunding platform LoveItaly! is planning to conquer the culture-loving hearts of the global community. On Tuesday, November 17 LdM Florence is happy to welcome to its premises a delegation of this new & innovative non-profit organization, whose main objective is to create an international movement to bring Italy’s cultural treasures to the attention of the global community – making all of us active stakeholders in protecting and sustaining a heritage that belongs to all humanity. Our special guests during this seminar are Tracy Roberts, Vice-President and one of LoveItaly!’s founders, Michela Santoro, their Blog and Community Manager, and Helga Weishaupl, who is also one of the founding members. Having these professionals among us also presents a unique opportunity to LdM students to interact directly with them during and after the seminar and to exchange ideas about mutual interests and fields of study. Their hands-on experiences will surely be of great value to a study abroad experience at LdM.